This fertilizer formulation is primarily for azaleas, camellias, gardenias and other acid loving plants that tend to prosper in acidic environments. It contains organic and man-made nutrients that will lower the soil pH factor and supply iron. This fertilizer blend includes cottonseed meal, elemental sulfur, iron sulfate, and potassium sulfate. There are three types of iron and four acidifying sources. The nitrogen sources are microbial, slow release types so that root burn is avoided. With all the ingredients in this special blend, other types of soil amendments usually necessary for azaleas are not required. 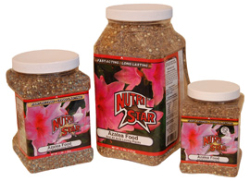 With continued use of NutriStar plant food, your azaleas should progressively grow more healthy and beautiful with each season. Great fertilizer for: Azalea, Camellias, Gardenias, Magnolias, Dogwoods, Ferns, Red Bud Jasmines, Hydrangea, and Caladiums.